The Toyota Tacoma performance parts create a rugged and resilient vehicle that can handle any terrain with ease. Between its high-strength steel construction and powerful V6 engine, it’s no surprise that the latest Tacoma reviews have been singing the praises of the truck’s phenomenal engineering. The Toyota Tacoma engine options use innovative engineering to maximize both efficiency and power. The standard 2.7L 4-cylinder engine generates 159 hp and 180 lb-ft of torque. The optional 3.5L V6 engine generates 278 hp and 265 lb-ft of torque. When properly equipped with optional Tow Package, the Tacoma can tow up to 6,800 pounds. The Toyota Tacoma engine is paired with an equally impressive transmission system. The Toyota Tacoma transmission is available in either a 6-speed manual or 6-speed Electronically Controlled automatic Transmission with intelligence (ECT-i) option. Plus, the optional Clutch Start-Cancel switch enhances traction and handling when tackling tough hills. 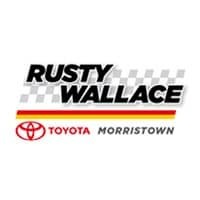 Compare the Toyota Tacoma to the Chevy Colorado at Rusty Wallace Toyota in Morristown- just a short drive from Sevierville and Knoxville.